The Department of Water Resources chart for the Frying Pan River near Reudi displayed a straight line of 220 cfs for over a week and this stability generally bodes well for excellent fishing. I’d experienced a nice day on Thursday, but could I repeat that experience on my last fishing day before returning to Denver for the weekend? Also, should I fish the water between MM10 and the dam or drive downstream further in hopes of finding a heavier green drake and PMD hatch as they generally progress upstream? These were questions I pondered as I packed up my tent and camping gear on Friday morning and prepared for a day of fishing. I retrieved my large fly boxes from my fishing bag and took an inventory of green drakes and added a few more to my frontpack foam patch. By 9AM I was packed up and ready to begin my day of fishing. The sky was once again a brilliant blue with no clouds in sight and the temperature was already in the upper 60’s. Dave Loch described some nice water near Strawberry Rock access on the lower river, and I’d never spent much time in that area, so I decided to sample it on Friday morning. I found a tiny pullout just below the MM4 sign and prepared to fish. My rod was already put together from the previous evening so all I had to do was remove the caddis and tie on a Chernobyl ant and beadhead hares ear. The next challenge was finding a path to the river as the bank was extremely steep and some dense bushes separated the road and river. After a short walk I found a faint trail and carefully descended to the river. I wanted to access an area twenty yards downstream where the river fanned out before plunging over some rocks, but the only way to get there was to wade along the bank and through some fairly attractive pockets. I made some downstream casts to the pockets before disturbing them, but I wasn’t very optimistic that I hadn’t spooked the fish by being in their upstream field of view. When I got to the shallower area I moved to the middle of the river and then toward the south or east bank so I wasn’t looking into the morning sun. I began casting back toward the middle and roadside bank and after a half hour of fishing landed a 10 inch brown that attacked the Chernobyl ant. Prior to this I foul hooked two or three fish that apparently refused the Chernobyl and I snagged them with the trailing nymph. The hares ear once again wasn’t producing any results so I switched it for a salvation nymph. As I moved upstream along the right bank I came upon a deep narrow slot along a red ledge rock and as my flies drifted tight to the rock wall the Chernobyl dipped and I set the hook and landed a nice 13 inch rainbow and photographed it. Next some fast water forced me back to the bank closer to the road and in a nice deep pool behind a current break I landed two very nice rainbows on the Chernobyl ant. The first fish was 15 inches and the second appeared to be 16 or 17 inches relative to the opening on my net. 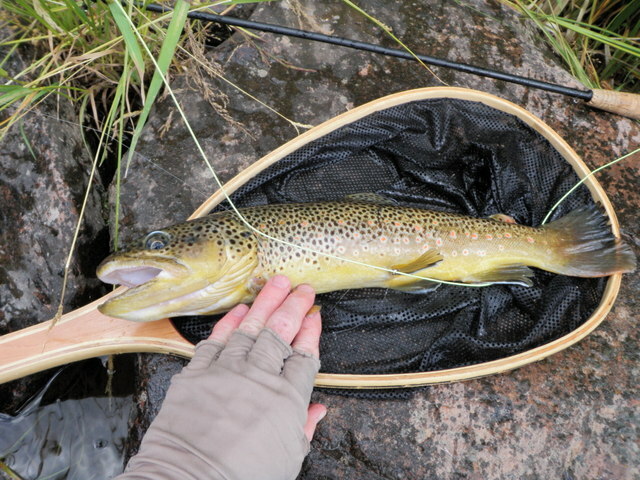 I was perplexed by the fact that I was catching only rainbows and attributed it to the fact that I was fishing two attractors, so I once again exchanged the salvation nymph for the hares ear and this resulted in two browns under 12 inches. Perhaps there was something to my theory of attractor vs flies with a more natural appearance. By now it was 11:40AM and I was positioned directly beneath the Santa Fe, so I scaled the very steep bank and sat on the top rim to eat my lunch. After lunch I resumed from my morning end point and proceeded around a bend and then through an area with a cluster of dead falls and fast water and then approached a huge wide pool. Another fisherman was stationed next to the attractive run at the head of the pool so I climbed out of the river and went around the pool. On the way I passed a host of fishermen eating their lunch or preparing to fish. The noon sun was now directly overhead and pounding down on everything below, and Friday was shaping up to be considerably warmer than Thursday. Above the large pool I encountered another inviting deep pool and as I drifted my Chernobyl and nymph combination I spotted a rainbow holding 4-5 feet below the surface. The fish showed interest several times in the Chernobyl by elevating closer to the surface and twitching its tail fin, but no take was forthcoming. I didn’t want to fixate on this fish as it was quite deep in the water column, so I moved along and fished some narrow slots next to the bank, but again I was not rewarded for my efforts. By 1PM it was quite warm and no clouds were in the sky so I decided to move further upstream in hopes of a higher likelihood of encountering a hatch. I drove to MM7 and parked in a pullout that contained a large White River National Forest sign. I grabbed my gear and walked down the road to a point just before some private water and made some half hearted casts with the Chernobyl and nymph combination. This clearly wasn’t working so I resolved to change things up and removed the two flies and tied on a parachute green drake thinking that I was further upstream and perhaps close to where the drakes were still hatching or maybe in an area where the green drake hatch was a recent event. I selected the size 14 green drake with an olive hackle, but the hackle had become deformed and pressed back so that no fibers extended beyond the eye of the hook. The fly didn’t ride correctly on the surface so I clipped it off and replaced with a size 12 version and this resulted in a foul hooked brown. I continued working up the left side of the river and began to see a few sporadic rises. This perplexed me as I didn’t see any insects riding on the surface or in the air above the river, so I paused to seine the water with my net, but this didn’t clarify the situation in any way. Much to my chagrin the mystery hatch intensified and the rises became more frequent. At a loss for an answer to what the fish were feeding on, I tied some tippet to the bend of the green drake and added a parachute ant with an orange wing post. I cast these two flies above the closest fish and most frequent riser and watched in dismay as the brown rose and pressed its nose against my ant without eating it. As this transpired another fish rose five feet above the lower one so I switched focus and lofted a curve cast above the new feeder. The flies landed so that the parachute ant led the green drake and a thirteen inch brown drifted up and consumed the ant! I was pretty excited to land this fish under very difficult conditions. Unfortunately the ant did not produce more action and the green drake was useless, so I clipped them off and tied on a rusty spinner from my Pennsylvania fly box but then added the ant back below the spinner. I attempted to catch the lower fish again with this new combination and actually pricked the fussy guy with the spinner. This was enough frustration from this area, so I moved on upstream and began to see emerging PMD’s, but quite sparse so I switched to the light gray comparadun AKA money fly. I landed a medium size brown along the left side, but the intensity of the hatch increased although still not as strong as Thursday. I surveyed the river which was actually a wide riffle of moderate depth and observed more rises along the right side so I waded to the middle and then moved below the more dense cluster of rises. Unfortunately an hour of frustration followed as the regular risers showed no interest in my usually effective light gray comparadun. I began a series of fly changes beginning with a yellow body comparadun and then a very light yellow sulfur version but still no luck. Four fish above me rose regularly but they ignored all my offerings. I finally conceded to these picky trout and moved back to the left bank and tied the proven light gray comparadun back on. The natural flies on the water during this hour of frustration looked smaller than my imitation so I probably need to tie some size 18’s before I return to the Frying Pan River. I now realized I’d gone fishless through the best hatch of the day, so I moved up along the left bank and spotted sporadic rises to stragglers as the hatch now dwindled. I was focused on an upstream rise when I spotted a subtle move and sip out of the corner of my eye in front of a tree branch no more than eight feet above me and to my left. I backcast and hooked a short cast above the rise and a large brown slowly appeared and sipped in my fly. This is the kind of visual action that keeps me addicted to this sport. After a strong fight and dogged head shaking I landed the 14-15 inch brown and brought my count on the day to nine. Once again I moved upstream closer to a spot where I spotted a rise and as I prospected the general area I spied a decent rainbow holding very tight to some dead branches along the bank. I attempted to hook some casts to the rainbow, but could not get above the fish due to the branches and eventually shot a cast to far and wrapped the fly and line. This forced me to wade to my fly to retrieve it and in the process I disturbed the fish. Another move upstream brought me to a sitiation similar to the last fish landed as I noticed a nice brown just above a protruding branch. This target however would not take my comparadun although it inspected and refused it. Next I tried a parachute ant with a yellow wing post and this provoked two or three refusals where the fish put its nose against the ant. I opened my patch and spotted the predator, a new fly I’d tied at the very end of the tying season. I only made two and it looked like a large realistic foam beetle. It went on to the end of my line and I plopped it above the brown, and the fish darted up and gobbled the foam creation. I set the hook and managed to prick the fish and then uttered a few expletives. Next came a nice deep area below some dead logs and I spotted another brown lurking in the partial shadows. The predator was still on my line but I added a beadhead pheasant tail and launched a few casts in the vicinity of the brown and on the third or fourth drift I saw a bulge and set the hook. The fish took off instantly and I thought I had fooled the brown in the shadows, but quickly discovered the fish was foul hooked in the cheek area by the predator, so I either experienced a refusal or I was late on the hook set due to the difficult lighting. At this point my progress was blocked by a jumble of logs so I climbed up to the parking lot and then found a worn path through the woods back down to a long deep pool with a vertical rock wall on the south side of the river. I covered this stretch to no avail as the water now appeared to be dead with no insects, not even stragglers present. Shortly after 4PM I reeled up my flies and called it quits with a long drive back to Denver ahead of me. The temperature on the dashboard in the Santa Fe was in the mid-80’s as I began to drive back along the Frying Pan River to Basalt. I probably should have spent the day or at least the afternoon above MM10 but at least I had the water to myself and did have an hour of hatch action. Unfortunately I couldn’t convert my opportunity as completely as I would have liked. After an enjoyable day of fishing I returned to my campsite and put up my tent and ate my light camping dinner. After cleaning up my dishes, I glanced at my watch and noticed it was only 7PM so I decided to get some more exercise by taking a walk to the lake below the campgrounds. Little Maude where I was camping is situated in the first loop that is closest to the main road and the next campground below Little Maude is Mollie B which borders on the lake. I hiked through Mollie B and followed a path through some willows and across a small stream and then came out on the rocky beach just above the marina. I strolled down to the edge of the water and found a flat rock to sit on. The water was extremely calm as most of the boating activity had ended for the day, so I took a photo and relaxed in the gorgeous scene before me. As I gazed around the lake and admired the beauty and the reflections on the water, a few rings appeared in the inlet next to me. In ten minutes while I rested on my rock I noticed four or five sporadic rises. Was it too insane to return to the campsite and retrieve my rod and reel and make a few casts to these fish? Absolutely not. This was my camping/fishing trip and I could choose to do whatever I wanted to. I hustled back up the path and gathered my frontpack, net and rod and reel and bounced back down to the inlet area. I quickly tied on a dark olive size 16 deer hair caddis and began to make casts in the proximity of visible rises. Initially I experienced a few refusals and then a momentary hook up, but it wasn’t long before I set the hook and landed a small eight inch rainbow. The current from the small stream continued along the shore across from my position, and it seemed more fish were rising in this area than in the still water of the lake in front of me. I spent the next hour flicking casts to the site of various rises and hooked and landed ten rainbows. Three were chunky specimen that were twelve inches in length and the remainder were in the 7-10 inch range. I’m guessing these were stocked fish, but perhaps they were resident fish that migrate to the inlet where they feed on insects that wash into the lake from the stream. At any rate, it was an enjoyable hour of fishing and icing on the cake after a great day on the Frying Pan River. I probably experienced as many refusals as landed fish, and there were numerous long distance releases mixed in. As darkness descended I reeled up my line and turned on my headlamp and carefully made my way back to the campground. 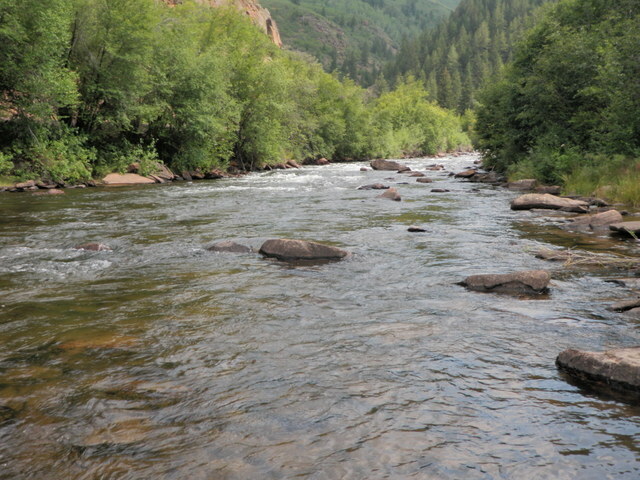 The Frying Pan remains my favorite stream in Colorado, and Thursday I was planning to make my first visit to these hallowed waters in 2013. 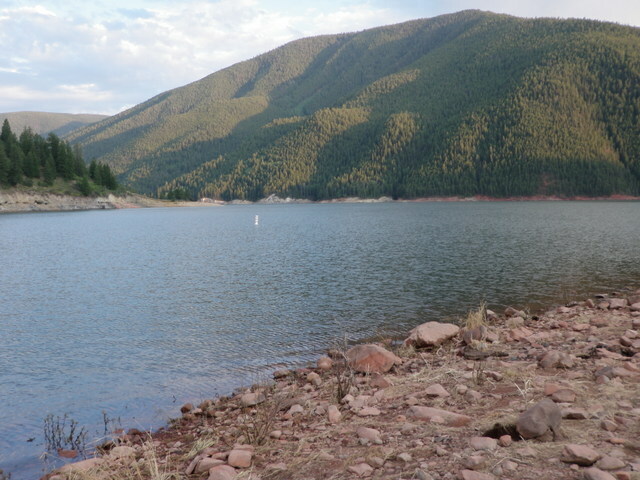 Everything about the Frying Pan is magical beginning with the fishing centric town of Basalt, the 14 mile road that follows the river, the red rock cliffs and walls, Reudi Reservoir, the campgrounds, the spring, and of course the fish. The river is actually more like a creek yet in these intimate surroundings there is a high density of trout in the 14 – 20 inch range. Let one not forget the hatches. I enjoy prospecting hopper/droppers but I’m still partial to match the hatch fishing to rising trout and I can’t recall ever visiting the Frying Pan without experiencing some decent dry fly fishing to a hatch. Dave Loch, a new friend from Air Products, paid the Frying Pan a visit in July and this only served to make me more anxious to visit and fish there. Finally on Thursday, August 15 I would fulfill my wishes. I was up early at the Lakeview Campground near Twin Lakes and began my journey over Independence Pass and through Aspen, CO and then on to Basalt. I stopped in Basalt and purchased a new bag of ice for the cooler and then stopped at the spring near MM 10 to refill my water container. From here it was on to Little Maude Campground by Reudi Reservoir where I quickly snagged site number 6 and then unloaded a few items to make it obvious that the site was taken. Next I reversed course and drove back down the road and parked at the large pullout by the spring. It was another warm day with clear blue skies, and I was concerned about how good the fishing would be. Most of the good pullouts on the upper two miles of the river were already taken, but no one was visible between MM10 and the spring, so I guessed that I could propsect the pocket water and work my way up toward the attractive water across from and above the spring. I had no idea whether green drakes or PMD’s would hatch in this area. I walked down the shoulder of the road as a steady stream of cyclists passed me on their way to Reudi Reservoir and stopped at the downstream border with private water as indicated by no trespassing signs. My starting point was just above a small island where the river widened to create some shallow riffles that I could wade across to get to the opposite bank. My strategy was to prospect the south bank and eventually arrive at the nice deeper pockets and pools across from the car. I was getting a bit of a late start as I entered the water at 11AM and of course I tied on a Chernobyl ant and beadhead hares ear. I probed some deeper slots and pockets on the side near the road with no success and then waded to the oppposite bank as planned. Here I was frustrated by a couple refusals to the Chernobyl ant, but then I extended a long cast closer to the bank to some nondescript water that was no more than three feet deep and I was surprised to see a buttery golden brown smash the Chernobyl ant. 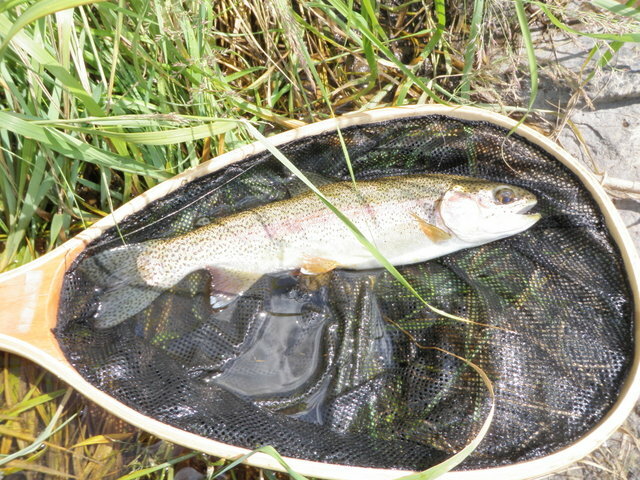 I carefully played the strong fish to my net and then carefully released it in some slow moving water to aid recovery. The beadhead hares ear didn’t seem to be adding any value so I exchanged it for a salvation nymph, and then in response to visible midge clouds, I added a third fly, a zebra midge larva. Eventually I switched the zebra midge for a RS2 and WD40. The Chernobyl, salvation and RS2 or WD40 became my workhorse combination as I worked up along the right bank and landed a 15 inch rainbow and another nice brown. I was amazed at the unspectacular locations that were yielding nice fish. By 1PM I’d landed seven fish and I decided to cross at the top of a second small narrow island and return to the car for lunch. Of the seven fish landed, one consumed the salvation nymph, two fell for the RS2 and four crashed the surface for the Chernobyl ant. All of my diverse trio of offerings generated some interest. I took my lunch to a large rock next to the river across from the spring and munched it while observing for visible fish or insect activity. I didn’t really spot anything of interest so I returned my lunch bag to the car and prepared to resume fishing. As I walked up the road before lunch I passed a guide and customer going the other way and noticed that they entered the river where I had just exited, so after lunch I decided to begin across from the spring and fish up along the right bank. This was really the attractive stretch of water I desired to be in and it was already close to 1:30PM when hatching activity might begin. As I began fishing another guide and customer appeared along the left bank 30 yards above me, but they weren’t close enough to create any interference of my fishing or vice versa. I began prospecting the same trio of flies that produced seven fish before lunch, but they were not longer favored by the fish. It’s amazing what a change of location and thirty minutes can do to fishing success. I hadn’t spotted any green drakes, but 1-2PM is generally the time when they appear, so I thought perhaps the fish were tuned in to them, or perhaps one could serve as a large attractor. I clipped off the trio of flies and tied on a size 14 parachute drake with a natural grizzly hackle. I’d used this same fly on the Taylor River and Big Thompson with success, but it was a bit mangled and the hackle was climbing up the wing post. The used fly did not seem to bother the fish as I landed a bunch of medium size browns. The first two came on downstream drifts in some deep narrow slots when I flicked the large parachute drake to the top of the lane and kept the line off the water and allowed the fly to slowly float the length of the slower moving water. As the fly reached the tail it was attacked aggressively by medium size brown trout. As I worked across the river I encountered a spot where the current angled against the far bank and then deflected and ran for another ten feet along the grassy bank. Here I landed another three browns that pounced on the green drake, and as I played and landed these fish I observed a nice sized fish rising and working in a shallow cushion of water just in front of a submerged rock next to the bank just above the deflection point. I made some accurate casts above this fish but it ignored my green drake yet continued to rise to something. I was now observing the occasional PMD in the air, so I clipped off the green drake and tied on a light gray comparadun and placed some nice drifts over the area of the rising fish, but apparently casting the green drake had alerted the fish and it no longer rose nor was it visible with my polarized sunglasses. I moved on and decided to revert back to the green drake but received several refusals so I swapped it for a fresh version with a dyed olive parachute hackle.This fly was slightly smaller than the bedraggled speciman I started with, and it also produced some fish. As this was transpiring several periods of overcast skies caused by some large clouds blocking the sun initiated a light PMD hatch, and this provoked another switch to the light gray comparadun but once again the fish ignored it. Again I reverted to a green drake but this time I decided to go large, and experimented with a size 12 parachute drake with a dyed olive hackle. Much to my surprise as I lifted my rod tip to recast when the fly was five feet in front of me at the lip of a small pool, a 16-17 inch rainbow snatched the big drake! What a thrill to pound up such a large fish that I hadn’t spotted just a few feet in front of me. 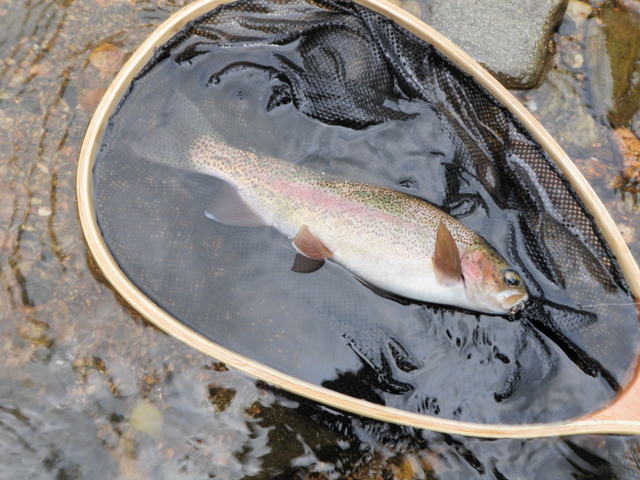 After releasing the large rainbow I resumed casting to rising fish in the deeper runs, but again I couldn’t generate any consistency. Once again some clouds moved in and another overcast period ensued thus provoking another wave of PMD emergence, and again I followed suit with a switch back to the comparadun. Ahead of me was a sweet 8X10 foot pool and as my comparadun drifted through the center of this area, a monster brown jumped on my fly. When I got a good look at the fish as I carefully played it, I was certain that it would measure in excess of 15 inches. Luckily I was able to get a close look at the fish as I landed it and spread it out on my net for a photograph and it was easily 17 inches if not 18 inches. I clearly remember that this was fish number 18 on the day, and I was shaking with excitement as I resumed fishing. Once again however the clouds moved on and the sun reappeared and the PMD hatch waned so I again returned to the size 14 olive hackle green drake. I prospected this fly through some smaller pockets as the river narrowed and offered fewer attractive spots, and added two more small browns to my count to reach twenty. It was now 5PM and I’d run out of juicy spots and I still had to put up my tent, so I retreated back along the south bank and then crossed back to the road, and called it a day, and a fine day it was. Twenty fish with four or five in the 14-18 inch range was certainly a satisfying effort. Catching fish on my parachute green drakes that I created over the winter was very gratifying as well, and being able to prospect and fool educated Frying Pan fish on the Chernobyl ant before lunch was an added bonus. I returned to the campground in a very happy state of mind. The thing about the Wildcat Canyon area of the South Platte is the effort it requires to reach this beautiful stretch of water. I’ve made this excursion quite a few times and it always takes at least an hour to hike the three mile Platte River Trail to reach the public stretch of the river. Perhaps my backpack is not the correct size or maybe I haven’t fit it properly, but I’m always extremely exhausted after these ventures. The weight of the pack causes me much neck and shoulder soreness, and of course a full day of fishing with repeated casting and wading and climbing over rocks and through streamside vegetation only adds to the fatigue. I was now situated close to the trailhead at Round Mountain so I could avoid the two hour drive and begin my hike earlier than previous occasions. I woke up at 6:30AM, ate breakfast, prepared a lunch and stuffed my backpack with all the essentials for a day of fishing three miles from my vehicle. This required some serious planning and thought as I first went through my mental checklist and then reviewed the list in my iPhone. Finally I was convinced that I had all the essentials and I proceeded to drive the ten minutes required to the trailhead. 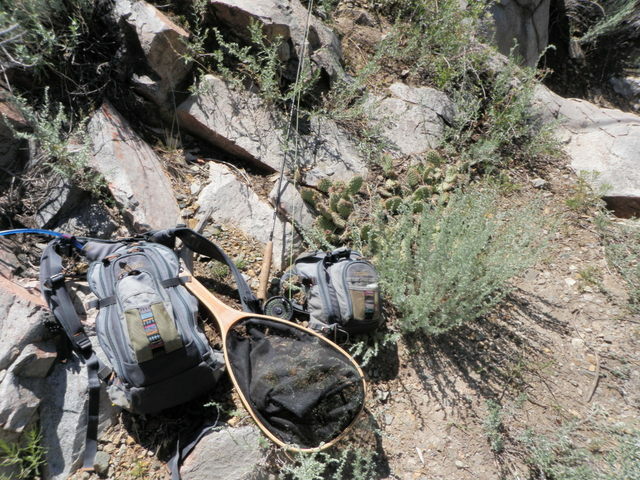 Here I hooked my fishing backpack containing my Camelbak water bladder over my backpack and began the trek into the canyon. The air temperature was 47 on the dashboard when I began, but rather quickly the radiant energy of the bright sun warmed me and the air to the seventies. I wore my running shoes and shorts and made steady progress along the nice trail that passes through tall ponderosa pines. By 9:30 I approached the open area with a stone fire pit next to one of the nicest holes on the river, and here I put on my waders and rigged my Orvis 4 piece, 4 weight rod and stashed my backpack behind a tree. As is usually my custom I continued to hike along the trail for another half mile or so to a point just above where the river cascades through a narrow gap in the large rock walls. 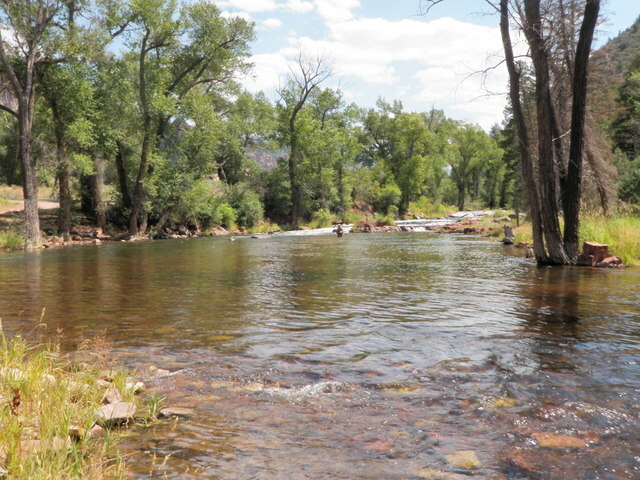 It was a bright sunny day and the flows were roughly 132 cfs. I had great success in 2012 in mid August when the flows were 167 cfs and in the fall at 80 cfs, so I was pretty certain this level would be close to ideal. My car was the only one parked in the lot at the trailhead, and I saw no other human beings on my morning hike. It was 10AM when I began fishing and I had the entire canyon to myself! I began fishing with a Chernobyl ant and beadhead hares ear. I reviewed my blog post from the August outing in 2012, and learned that this combination did the heavy lifting at that time, so I hoped to repeat my success. This strategy worked well as I landed 17 fish between 10AM and noon. Quite a few fish were rising and smashing the Chernobyl and the other difference was the number of rainbows landing in my net compared to brown trout. Over the course of the day I estimate that 70% of my catch was rainbows and 30% browns. This was quite different from a year ago. I quit for lunch at noon and hiked back to the place where I stashed my backpack. Along the way I passed a young couple with two girls on a pleasant hike, but clearly not embarking on a fishing outing. After lunch I returned to my lunchtime exit point and continued up along the left bank of the stream using the same combination of flies and continued to land fish at a steady rate. During this time I approached a nice long pool below some large protruding rocks. The current break created smooth water that was ten feet wide and 25 feet long with a deep current seam on the far side away from me. I hooked two very nice rainbows along the current seam, one at the tail and one in the mid-section. These fish fought hard and eventually slid down beyond the large protruding boulder at the base of the run, and in both cases my fly popped free as the fish thrashed next to the rock. I was quite disappointed with these lost fish, but how could I remain in grief with the great scenery and a catch rate approaching eight fish per hour? Another memorable moment was fish number 24. I flipped a short cast above the lip of a pool and almost instantly the Chernobyl paused and dipped and I set the hook and discovered I was attached to a fine battling trout. I played it up and then down for a few minutes and prayed it wouldn’t attempt the same manuever as the previous large rainbows. This time, however, I held on and finally netted a beautiful 15 inch cutbow that featured the pink stripe of a rainbow, but also displayed the orange slash of a cutthroat and the fine black speckles on the sides similar to a cutthroat trout. At 2PM the action slowed relative to what I was experiencing earlier and I spotted some tiny mayflies in the air so I swapped the beadhead hares ear for a RS2. This didn’t improve things, so I inserted a salvation nymph and attached the RS2 below the salvation, and this combination produced the last ten fish of the day with most hooked on the salvation nymph. On the day I probably landed 10 of the 40 fish on the Chernobyl ant, and as I commented earlier, I was surprised that roughly 70% were rainbows and 30% browns. Perhaps the higher ratio of rainbows resulted from lower flows which enabled me to fish more midstream pools, and not focus as much on the banks and edge. It seemed that the browns came from the rocky banks and generally they opted for the more natural trailing nymphs. The rainbows on the other hand liked deeper water and larger pools and there tended to be multiple rainbows in the same place; whereas, the browns were solitary and more territorial. The rainbows also seemed more apt to go for attractors; flies that don’t really imitate a specfic insect such as Chernobyl ants and salvation nymphs. All in all it was a great day. Several periods of clouds moved by in the afternoon but it never rained nor was there ever a hatch that resulted in surface feeding. 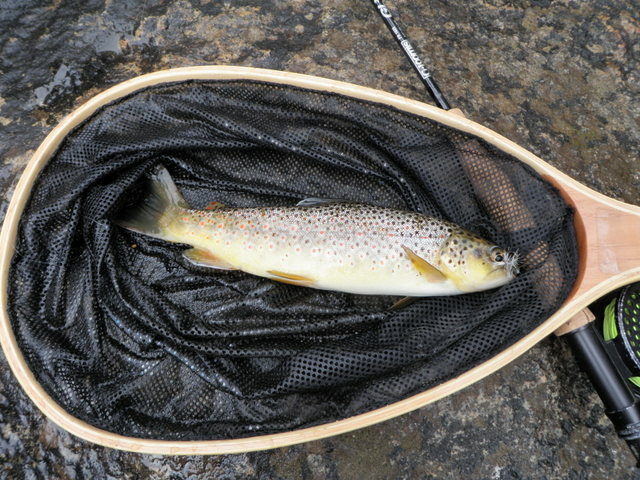 The size of the fish was decent, although not as impressive as the preponderance of browns landed in August 2012. The larger fish during this visit tended to be rainbows. It would be interesting to return and focus on the banks to see if this would change the ratio to predominantly browns. Of course this would necessitate another two hours of hiking with an ill fitting backpack, and I can’t consider that until more time has elapsed. Time causes me to forget the discomfort and exhaustion, but remember the fishing. The one hour exit hike was even more taxing than the entrance, but I survived and drove on to Lakeview Campground near Twin Lakes on the way to Independence Pass where I rested and prepared for Thursday on the Frying Pan River. Flash floods are a real danger in Colorado, and Jane told me about a severe occurence several weeks ago in the narrow canyon along route 24 west of Manitou Springs. Apparently a local thunderstorm dumped a deluge of rain in a short amount of time and this resulted in a flash flood that caused one death and swept numerous vehicles downstream in a muddy torrent. 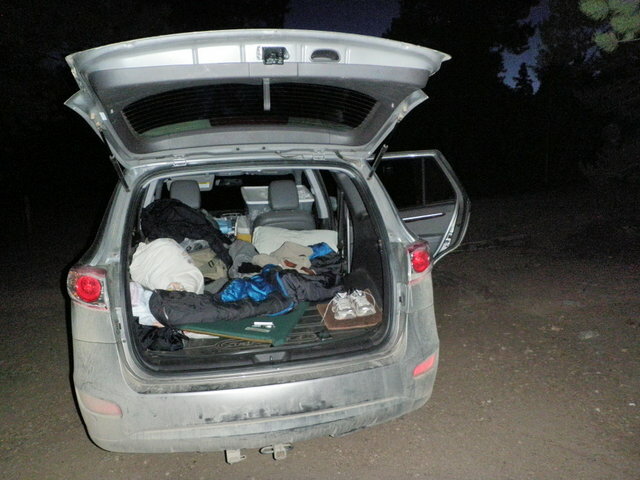 I left work in the morning on Tuesday and packed the Santa Fe for a three night and three day fishing/camping trip that I expected to result in a day on the South Platte River and two days on the Frying Pan River. Everything was packed, and I was on my way by around 1PM. I was quite excited to have nearly a week to explore some of my favorite waters in Colorado as I made my way south on interstate 25 through Colorado Springs and then west on route 24 toward Manitou Springs. Yes, I was traveling through the same area devastated by a flash flood several weeks ago, and in fact as I began driving up the narrow twisty stretch I saw a large flashing highway sign announcing a flash flood watch. I looked west and sure enough the sky was darkening, but I made a quick assessment that the clouds were fairly distant, and I could travel through the canyon stretch before any rain might commence. This turned out to be an accurate decision as I reached Woodland Park west of the canyon stretch as rain began to hit the windshield. 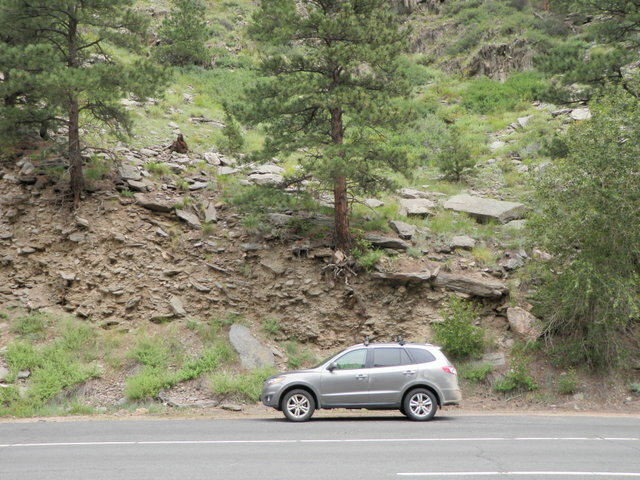 Along the way, however, I saw the result of the previous flash flood with side roads converted to deep gulleys and massive piles of red sediment along the roadway in several areas where the CDOT crews had removed it from the highway. By 3PM I’d reached my planned destination of Happy Meadows Campground, a small campground situated right along the South Platte River a mile or two away from the Platte River Trailhead that I planned to depart from on Wednesday morning. Unfortunately I was faced with another setback as the small campground was completely full. What was I to do now? 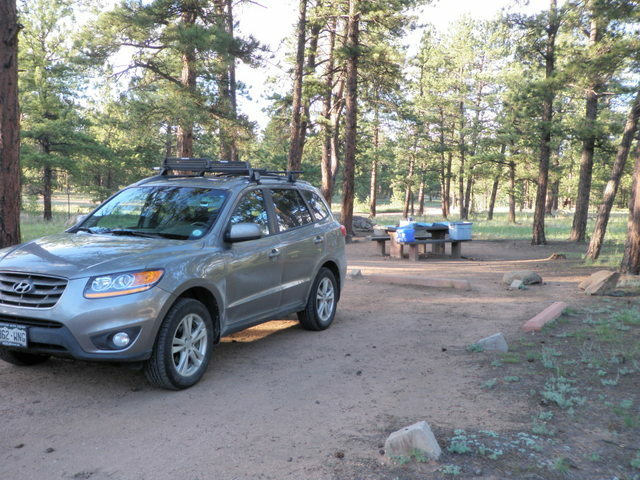 I had checked alternatives prior to departing Denver and remembered another national forest campground further west along US 24 as well as nice campground that we’d used as a family called Spruce Grove. I turned into a pullout and removed my Colorado map from the glove box and checked the distances. Clearly Round Mountain was the closest and only five miles or so west of the turn off I had taken from route 24. I reversed my direction and returned to the highway and sure enough a five to ten minute drive led to Round Mountain. I circled the campground and there were 16 sites with only three occupied so I snagged number 16 and unloaded my water container, tablecloth, and camp stove and paid my fee for one night. It was 3:30PM by now, and I decided I could whet my appetite for fishing by returning to the South Platte near Happy Meadows and test the waters for a few hours. I always drove by this water on my way to the Platte Trail and wondered what the quality of the fishing was like. I passed Happy Meadows and drove slowly along the dirt road while glancing to the right to review the water. 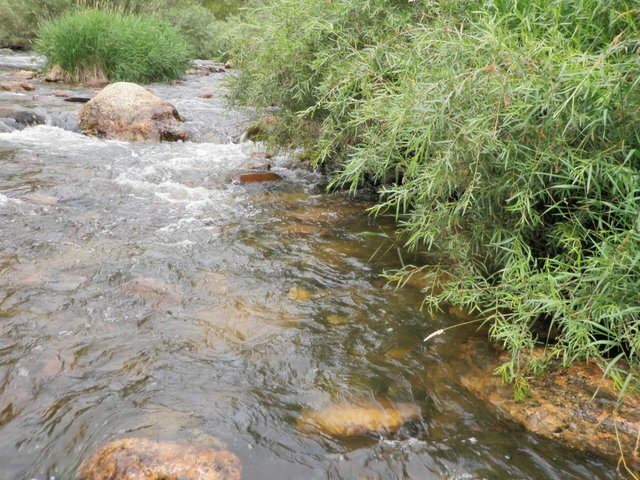 I was looking for some faster stretches with rocks and pockets as other fishermen tend to avoid this type of stream structure, and with the hot August temperatures, fish are attracted to these well oxygenated areas. Roughly half a mile beyond the campground I found just this type of water and parked in a large pullout and prepared to fish. By 4PM I was on the water with my Loomis 5 weight rod featuring a Chernobyl ant and beadhead hares ear, and I crossed to the bank away from the road and began working my way upstream. Nothing showed in the first fifteen minutes or so, but then I added a small RS2 after spotting several tiny mayflies. 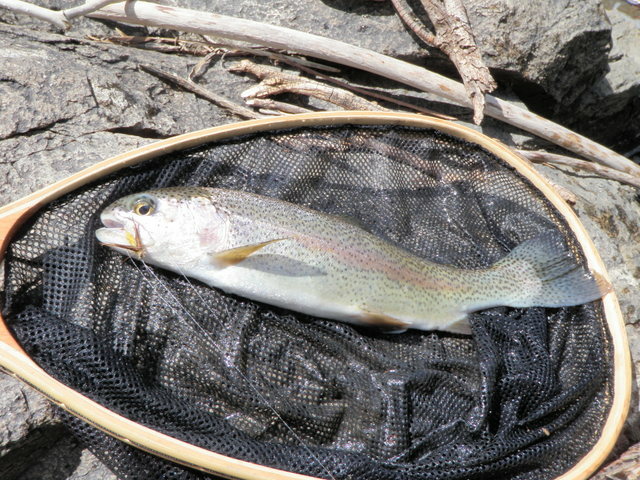 In a short amount of time I landed three small trout, two browns and one rainbow. The rainbow took the RS2 on a lift, and the two browns grabbed the hares ear on the dead drift. After this initial success I somehow broke off both nymphs even though I couldn’t recall any significant snag and I replaced them with a salvation nymph. This ended up producing quite well over the remaining hour or so of fishing as I supplemented my count by five to reach eight on the evening. The fish seemed to like movement with most hammering the nymph on the lift or on a twitch or during a poor mend. I had difficulty seeing my flies in the first hour as I was on the east side of the river looking into the sun glare from the western sky, so I crossed back to the west side and this helped quite a bit until the shadows covered the river. 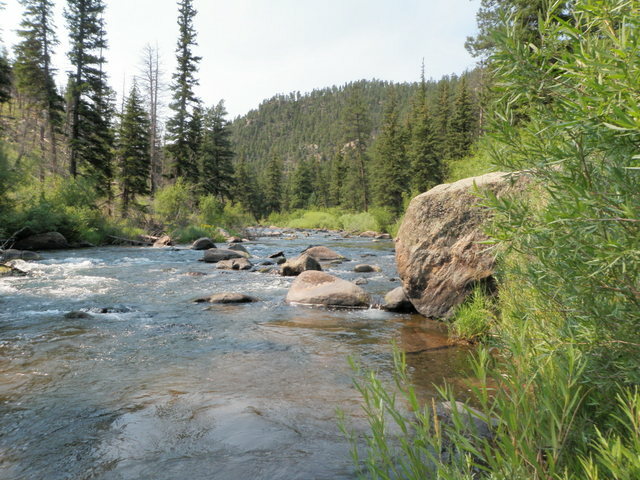 In the last half hour I fished a stretch below where I parked the car, and it was more typical South Platte River water with long runs, fine gravel bars, and no large rocks or pocket water.During this time I had a pair of refusals to the Chernobyl so I switched to a light gray caddis, but this also generated rejection. At 6:30 I decided to call it quits and return to the campsite to made dinner before it got dark. I’d experienced a nice introduction to fishing in the South Platte River, and I was optimistic that I’d have a decent day on Wednesday. 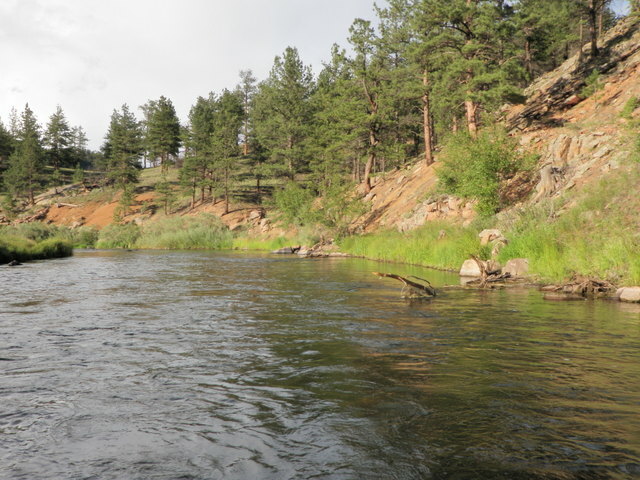 Jane and I decided to embark on another camping trip on the weekend beginning August 9, and I had been following the fishing reports on the Arkansas River through the Royal Gorge Angler and ArkAnglers web sites. Both sites suggested that numerous bugs continued to hatch on the Arkansas including pale morning duns, caddis, yellow sallies and red quills. 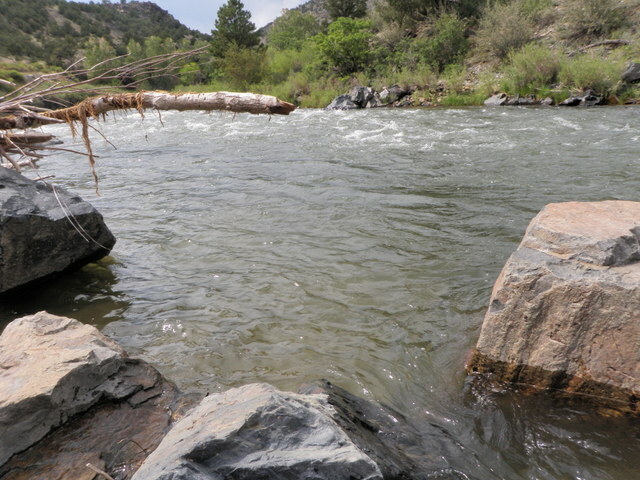 The flows were back up to the 740 cfs range after a fair amount of rain earlier in the week, but both sites indicated that the water clarity was good. 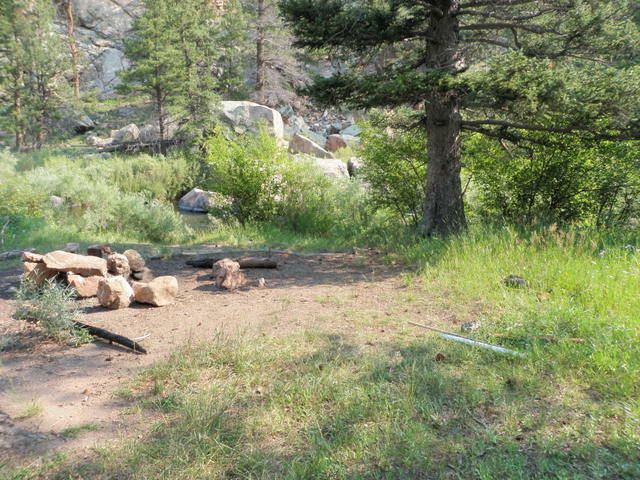 One of our favorite campsites near the Arkansas River is Angel of Shavano as it is fairly remote, and we’ve had good luck finding sites available without a reservation. 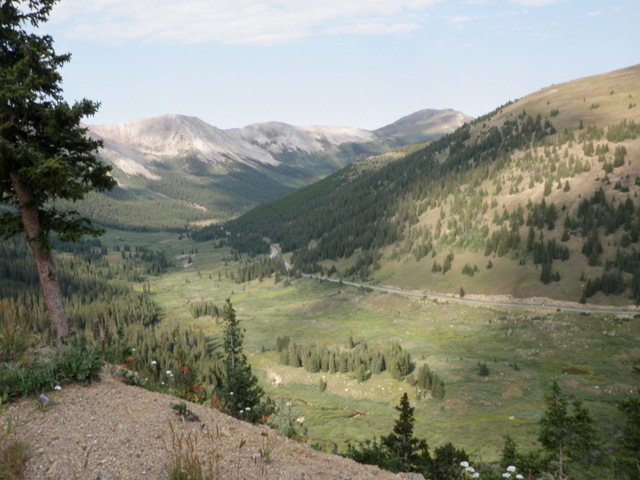 The campground is roughly five miles off of route 50 as one drives west toward Monarch Pass. Jane and I decided to make this our camping destination for the weekend. Jane was able to get off work early on Friday, so I packed the car and picked her up outside her office in downtown Denver and we were on our way by 2:30PM on Friday. We drove through several rainstorms as we took 285 southwest and crossed South Park; however, the rain had ended by the time we reached the campground. With some threatening clouds remaining in the western sky, we set up both our tent and our canopy before eating dinner and going to bed. On Saturday I planned to take the Santa Fe and drive to the Arkansas River to fish for the day while Jane expected to hike the Colorado Trail toward Mt. Shavano as the trailhead is right next to the campground. I was able to depart by 9:15 and arrived at the river by the Fremont-Chafee County line by 9:45AM, and I got my waders wet by 10AM. The sky was bright blue with no clouds visible and the air temperature was in the low 70’s as I began. The water was a bit off color, but actually perfect for fishing as the fish could still see the surface but less care was required in approaching fish. I considered crossing the river at the tail of the long pool below where I parked, but changed my mind as I gazed at the higher volume. Why risk it when I had practically the entire river to myself? I climbed back up the bank to the road and walked east along the shoulder for .3 mile and then descended on a worn trail next to a vertical rock wall. I decided to begin with a yellow pool toy hopper and trail a beadhead hares ear. There was a nice wide run that deflected off the vertical rock wall below me, but I couldn’t interest any fish in my offerings in this area. I moved further upstream to a nice wide tailout below some long riffles, and here I landed a small brown on the beadhead hares ear while I experienced two additional momentary hookups. I continued on fishing mostly the 10 to 15 feet of water out from the left bank, but nothing was going for my flies, so I swapped out the pool toy for a gray parachute hopper. This at least generated some refusals but I couldn’t close the deal and the trailing nymph wasn’t generating any interest. I again switched flies and experimented with a yellow Letort hopper as the top fly and tried a 20 incher as the trailing fly. It was about this time that I glanced at my watch and noticed it was 11:30, and I was quite close to the spot where I parked the car, so I exited the river and climbed the steep slope to a nice high rock overlooking the river. Here I munched my lunch while observing, but I didn’t really see any evidence of fish. After lunch I circled around the large lunch rock and positioned myself at the top and adjacent to the beginning of the deep pool just below the lunch rock. I began making casts into the slow moving water and just as my confidence waned and thoughts began to enter my head to move on, a nice rainbow emerged from the depths of the pool and slowly glided up to the Letort hopper and confidently devoured it! 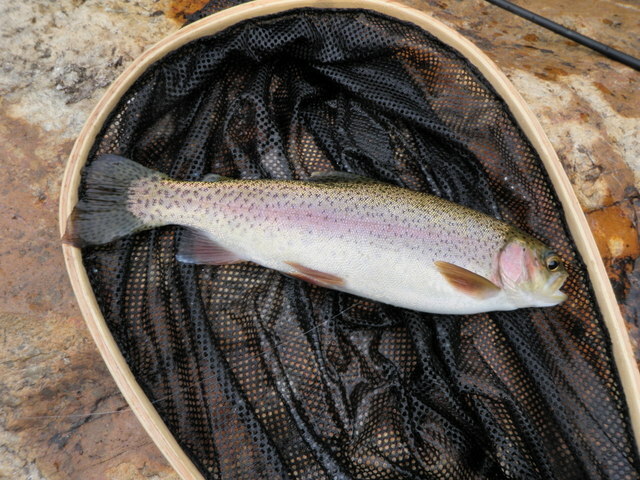 Much to my surprise and delight I was connected to a battling 14 inch rainbow and I moved closer to the river and netted the fish after a brief battle. I continued on and added a few more fish to my total but the 20 incher wasn’t producing and it was a heavy fly to support with the dubbed body hopper, so I decided to trade it for a lighter nymph. As I inspected my fly patch, I noticed two iron sallies that I’d tied over the winter. These nymphs are intended to imitate yellow sallies and the reports suggested that yellow sallies were present in early August. Lacking another strategy, I tied on the iron sally and it proved to be an excellent choice. I began to pick up fish on a more regular basis on the iron sally but now the yellow Letort hopper ceased to produce and it was becoming waterlogged quite frequently. If the top fly wasn’t producing fish, shouldn’t it at least be buoyant and easily seen? 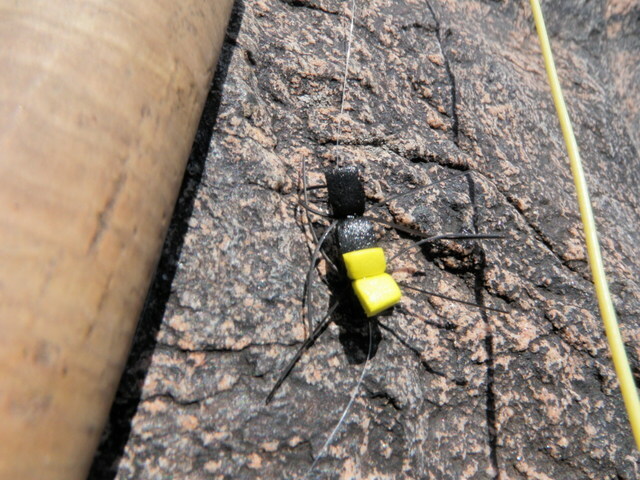 Of course, so I went to my old standby, the Chernobyl ant. The Chernobyl ant combination would produce most of my remaining fish with a few exceptions. I worked my way along the left bank and plopped the two fly combination in all the likely pockets and slots behind current breaks. The Hofer strain rainbows now populating the Arkansas River proved to be my saviour on this Saturday. The rainbows occupied the deeper eddies and pools, and in many cases I could spot them hovering a foot or so below the surface. They didn’t smash my flies instantly, but if I spotted them and put enough casts over them, I could generally eventually extract a smashing take of the Chernobyl or a grab of the iron sally as I lifted to recast. I was stuck on nine and working hard to reach double digits when I encountered a nice long eddy where the current circled back along the bank until it intersected with a large rock that protruded into the river. The intersection of the current flowing downstream past the rock and the recirculated current along the bank created a sucking vortex. I cast upstream but short of the whirlpool and allowed the Chernobyl to drift slowly toward the intersection when a large mouth surfaced and inhaled the surface fly. I set the hook and saw a large rainbow clear the surface and crash back to the river, but the connection didn’t last long before the fish was gone. I reeled up my line and discovered the trailing iron sally was gone, so I’m not sure if the fish rolled on it or whether it got hooked into a rock or branch in the short battle. I was disappointed to lose a nice sized number ten and I only had one more iron sally in my fleece patch. I mustered my energy and focus and moved on upstream after replacing the iron sally with a beadhead hares ear. In a short amount of time I encountered another nice narrow deep ten foot stretch of water, and as I began casting I spotted another rainbow positioned in front of a large submerged boulder. I made at least ten drifts over this fish, but it showed no interest in my offerings. I paused and observed closely and saw the rainbow rise to the surface and sip something quite miniscule from the film. What should I do? In these situations in the past I have resorted to a parachute ant, so I decided to give it a try again. Unfortunately while I concentrated on tying on the ant, the trout disappeared. I was ready to cast but now my target was gone. But wait a second, I looked below the submerged rock and now there were not one but two rainbows hovering six inches below the surface in front of another submerged rock. I made a couple extremely short casts and allowed the two flies to drift no more than five feet below me, but the flies were beyond the two fish. I could clearly see the orange poly tuft on the parachute ant leading the Chernobyl ant, so I was pleased with that circumstance. I lifted the two flies and gently placed them on top of the upstream submerged rock and watched as they slowly drifted to the position of one of the rainbows. As I held my breath the rainbow slowly elevated and tipped its nose above the water and sucked in my ant. In a split second I lifted my rod tip and the agitated rainbow splashed and fought but eventually slipped over the wooden rim of my net. Number ten was certainly worth waiting for. It was now late afternoon and some large gray clouds began to build in the west. I attempted to recover my earlier magic on the nymph and tied on my last iron sally, but this didn’t produce as it had done in the early afternoon. I came to a nice long side pool where a long log or stick jutted out over the tail above a large protruding rock and I made a nice long cast ten feet above the rock. 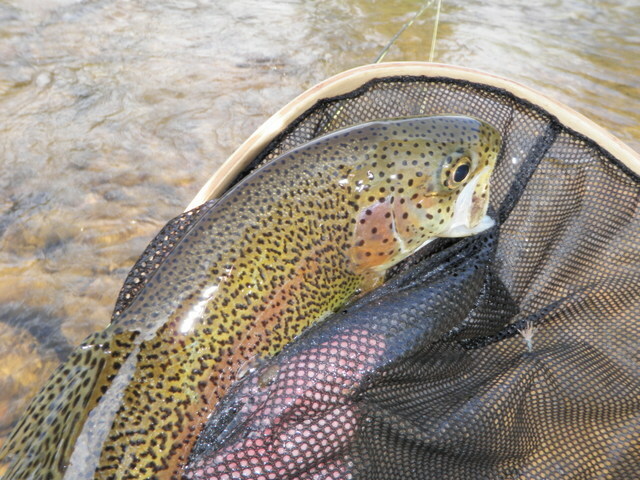 The slow current brought the Chernobyl ant bobbing back toward me and just as I was preparing to lift to recast before the nymph tangled in the rock, the foam fly disappeared, and I made a slightly late hook set, but connected with another nice rainbow. Perhaps I didn’t need a trailing nymph? With the darker skies and lower light intensity I hoped that perhaps some pale morning duns would emerge, so I decided to exchange the now unproductive iron sally for a salvation nymph. This proved to be a fortuitous move as the last three fish landed snared the salvation nymph. The most memorable was a 14 inch brown that stopped the Chernobyl ant by snatching the salvation nymph in a tiny pocket that was no more that two feet deep right along the bank. I released this fish and as I did so, heard the intimidating sound of thunder and saw a flash of lightning in the distant western sky. I wanted to catch another fish, but I also didn’t want to get caught in a thunderstorm deluge. I picked up the pace and quickly covered some attractive water along the bank, and it wasn’t long before I landed a small brown to reach 14 fish on the day. With this fish released, I hustled through some thick brush, climbed a steep narrow path and reached the shoulder of route 50. I quickly strode east along the highway until I reached the Santa Fe. I tossed my rod, wading stick, frontpack and backpack in the back of the car and as I stepped into the driver’s seat with my waders on, it began to pour. Timing is everything. 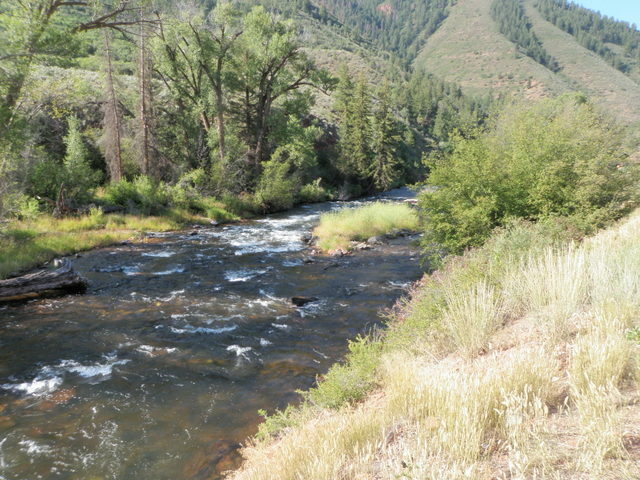 My original plan for the week of August 5 was to work Monday and Tuesday and then drive to the Happy Meadows Campground on Tuesday evening so that I was positioned to hike into Wildcat Canyon and fish the South Platte River on Wednesday. 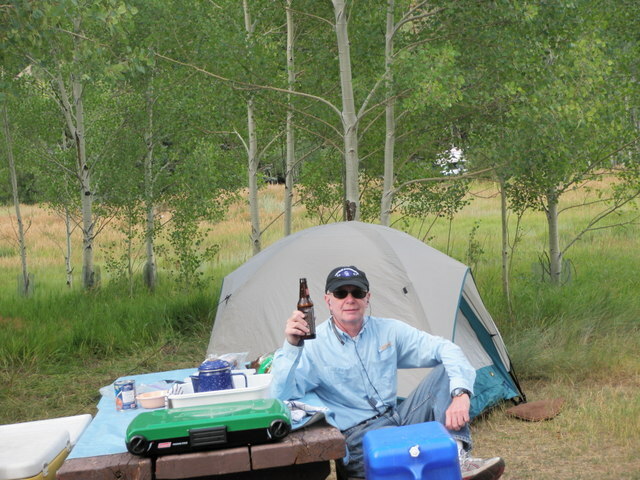 If all worked out, I planned to camp again on Wednesday night and then fish in Eleven Mile Canyon on Thursday. Unfortunately when I checked the weather report for Wednesday it called for an 80% chance of rain and 1 to 2 inches. This forecast spooked me so I decided to defer this trip and instead I reported to work on Wednesday. The upside to all this is that I completed everything I can at work for July closing, so I am now in wait mode until the office manager completes her portion of the process. This probably won’t happen until August 26, so I’m pretty much free to fish for the next week and a half. 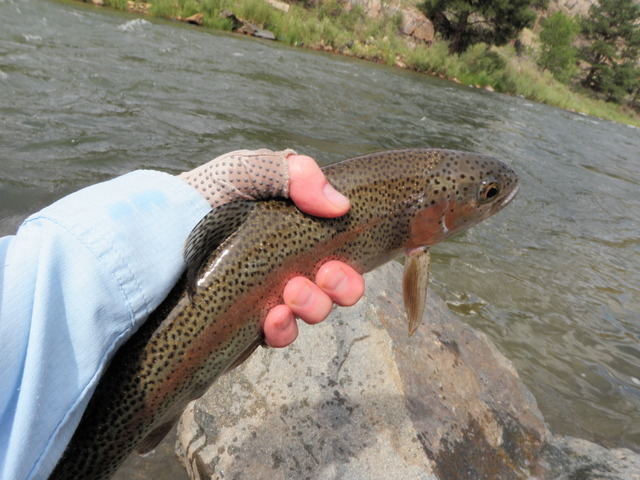 Thursday became the first open date on my calendar so I made a trip to the Big Thompson River. The forecast for Estes Park on Thursday projected overcast skies and a high of around 70 degrees. This forecast did in fact turn out to be accurate. 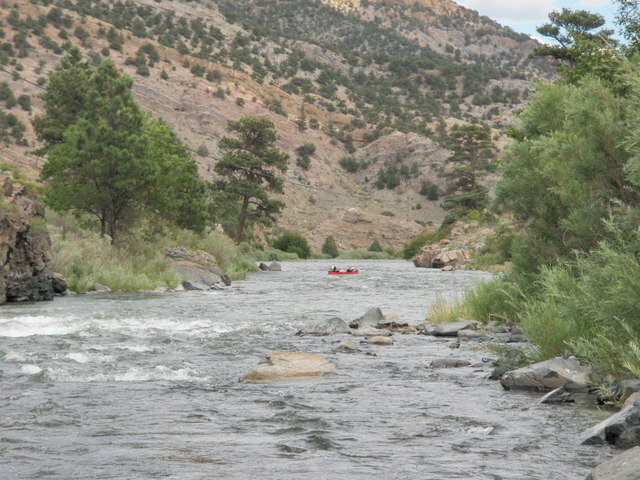 The flows on the Big Thompson were slightly reduced to 90 cfs after running at 125 for most of the summer. These flows are still quite high for August, but create decent fishing conditions. I felt that the slightly lower flows and the cooler weather and overcast skies would create an ideal environment for catching fish. Was I right? I set out by 7:15AM and arrived at the river by 9AM and was in the water fishing by 9:30. It was quite cool when I began, so I wore my fleece under my wader suspenders, but after 20 minutes or so the sun came out and I circled back to the car to return the added layer. After approximately 20 minutes of fishing a fish rose and smashed my 14 inch caddis with a palmered body and I landed my first fish of the day, a chubby rainbow trout. I was noticing quite a few midges in the air so I added a size 24 zebra midge dropper below my bushy caddis and picked up a small brown on the midge. 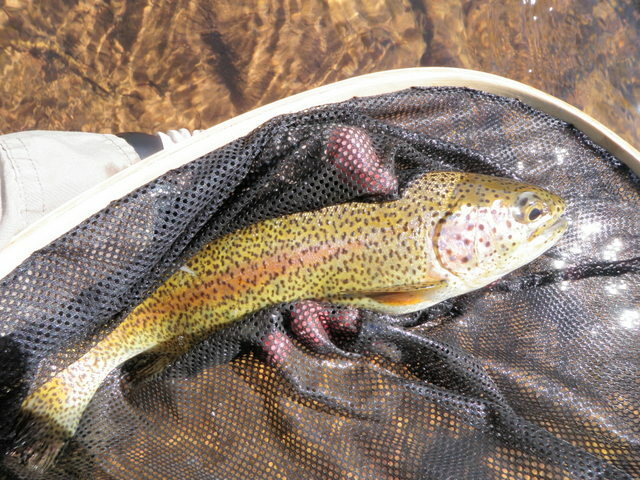 After this however I went quite awhile before another similar sized rainbow gulped the caddis. Once again a dry spell commenced so I eventually removed the caddis and midge larva and decided to try a parachute green drake. This fly had been effective during my last visit to the Big Thompson, so why not give it another try? I was below a narrow slack lane next to the willow covered bank so I made a left handed cast approximately 10 feet upstream and as the drake drifted back toward me, a fish darted from cover and blasted the green drake. I still had the rod in my left hand so I set the hook and played the fish which turned out to be an eleven inch brown. I was quite proud to land a fish almost entirely left handed. I remember looking at my watch and being pleased that I’d landed four fish in the first two hours by around 11:20, but before I returned to the car to eat, I landed another small brown on the green drake. By 11:30 I was feeling quite hungry so I walked back along the shoulder of the highway to the car, and then executed a U-turn and found a pullout above the point where I’d exited for lunch. Here I crossed the road with my lunch bag and water and munched away on a nice flat rock overlooking the river. After lunch I returned to my exit point which represented a nice opportunity to cross the stream to the opposite bank as the river fanned out and presented shallower depth and less velocity. My theory was that the flows at 125 cfs prevented other fishermen from covering the left bank, and this would work to my advantage. The sky brightened a bit, but there were still numerous large high clouds blocking the sun’s attempt to warm the atmosphere. I resumed prospecting with the parachute green drake, but covered quite a bit of water with only a few refusals to show for my efforts so I resorted to my old faithful combination of a gray hares ear parachute hopper and beadhead hares ear nymph. This didn’t really improve matters so after a fairly short test in some very attractive water, I replaced the beadhead hares ear with a salvation nymph, and this proved to be the best combination I would discover on Thursday. The catch rate improved so that I landed another nine trout after lunch with most of the activity taking place between noon and 2:30. Most of the fish grabbed the trailing salvation nymph with at least one aggressively smashing the hopper imitation. It was the typical type of fishing that I enjoy; prospecting all the likely spots with three to five casts and moving on quickly. The downside of working the bank away from the road was the difficult maneuvering required to migrate upstream. It involved rock climbing, moving up and down steep banks, and crashing through thick brush and tree limbs. This resulted in increased movement time and reduced time with my fly on the water as well as increased fatigue. By 3PM the sun was peaking out more frequently and the action slowed considerably so I decided to try the green drake again. I skipped past some fast water and walked up along the shoulder of the road looking for the most attractive water. When I found a nice pool and shallow riffle area I positioned myself downstream and covered the area with the green drake, but nothing was interested in my offering. I glanced at my watch and noticed it was 3:30 and I was feeling more tired than normal so I decided to call it a day. 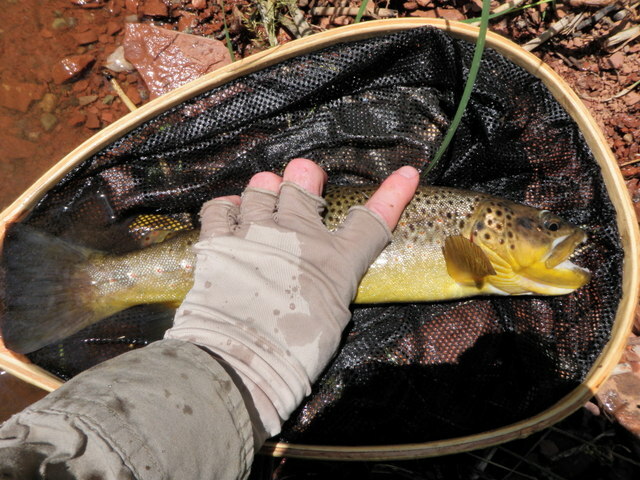 I was pleased to land 14 fish on the Big Thompson despite the fact that I saw very little hatching activity in spite of overcast skies and cool temperatures. Roughly half of the fish landed were rainbows and the other half browns and the largest fish was probably twelve inches. I probably had half a dozen momentary hook ups and long distance releases, so it could have been a better day, but overall I’m pleased with the outing. It surely served as good exercise. Additional rain fell on my tent Thursday night and I awoke to damp conditions on Friday morning, however, this didn’t stop me from preparing for a day of fishing on the Taylor River. I had some breakfast and then packed a lunch and added a few additional green drakes and light gray comparaduns to my frontpack fly patch. Before the trip I’d cleaned up my patch by removing all the nymphs and wet flies except for one working fly. I placed all the extras in my fleece pouch and this freed up space in the foam patch for additional dry flies. 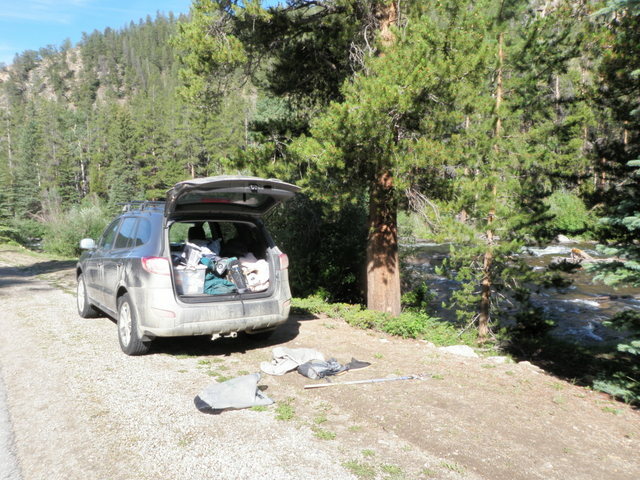 I made the short drive from the campground to the same parking space as I’d used on Thursday, but my strategy for Friday was to wade across the river at a wide shallow spot just upstream from the car, and then negotiate my way downstream through the woods to a position across from the Lodgepole Campground. In theory the fish on the far side of the river had not been pounded with as many flies as those along the road, and I would be the beneficiary of these less pressured fish. I’d experienced decent success with this approach in previous seasons, and being right handed, I liked working upstream on the left side as it is easier to hook casts in toward the bank and under overhanging vegetation. The sky was bright blue and largely devoid of clouds and this would continue for most of the day. There was a brief period in the early afternoon where some large clouds temporarily blocked the sun, but these periods didn’t last more than a few minutes. During visits in 2012 I had decent success with a gray parachute hopper trailing a beadhead hares ear, so this became my initial combination on Friday. Despite all the planning and thought just described, I fished for at least 1.5 hours before I experienced any action. Finally I approached a spot where a large boulder protruded into the river from the bank and a huge pile of branches and sticks created a partial dam between the bank and the large boulder. By this time I’d given up on the hopper/dropper and tied on the same green drake parachute that produced a couple fish for me on Thursday. I carefully climbed to a comfortable position on top of the debris but maintained a low profile and began to prospect the slow area beginning along the left side and gradually fanning out casts to the right. After I’d covered the water left to right I allowed the drake to drift very deep into the nook right in front of the boulder. In another second the fly would be devoured by the swirling current against the rock, but before that scenario could unfold, a fish darted to the surface and sucked in the parachute. My reflexes kicked in and I set the hook and lifted the rod high to keep the fish out of the debris pile I was standing on. Several times the brown attempted to wrap the line around the sticks, but I kept it upstream. Unfortunately I was not in a good position to net this fighter so I began to carefully step closer on some stable sticks while extending my arm outward and as high as I could. As I did this risky maneuver, the fish finally executed its escape move and darted under one of the branches. Fortunately for me, however, the fish just hunkered there under a few sticks. I made another step to the point where I could reach my net under the stick and scoop the 14 inch brown. Somehow I was able to outwit this underwater foe, so I snapped a few photos and then released the fish. At this point I fed the fly under the branch and extracted it still tied to my line. After this initial success I continued with the green drake, but the other fish were not as enamored as the 14 incher. 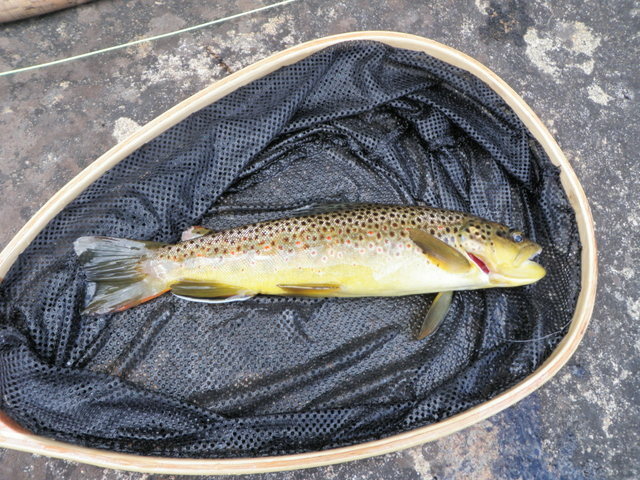 Eventually I came to a nice deep run and converted to deep nymphing with a beadhead pheasant tail on the point and this produced a second brown trout. But alas this approach could not repeat the success so I returned to a parachute hopper with a beadhead pheasant tail as the dropper. The pheasant tail probably produced the best particularly during the short period where some clouds blocked the sun, but even this success required much wading and casting. 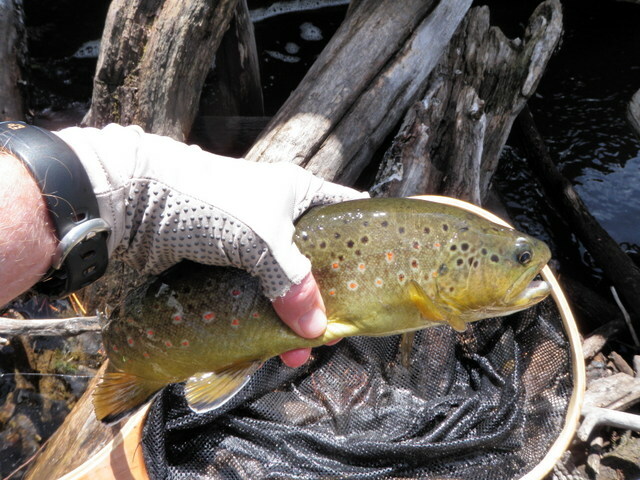 By 4:30 I’d managed to land 9 trout with the initial brown representing the largest catch of the day. The sunshine and blue skies were ideal for human beings, but apparently not to the liking of brown and rainbow trout in the Taylor River. I crossed the river upstream of the point where I’d crossed in the morning and walked back along the road to a point above the Santa Fe where I’d ended the previous day. 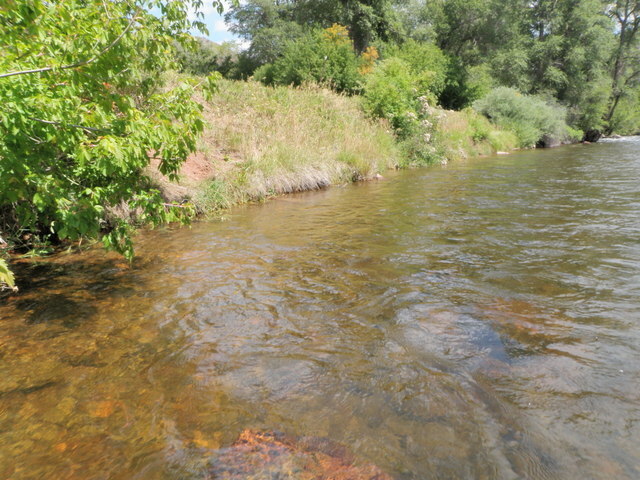 I paused and stared at the water in a nice moderate run with around four feet of depth and noticed a nice brown facing the current. This was approximately ten feet above the shallow riffle where I’d landed two rainbows on Thursday evening. I decided to focus on this fish as I could see it was moving side to side and feeding on something. 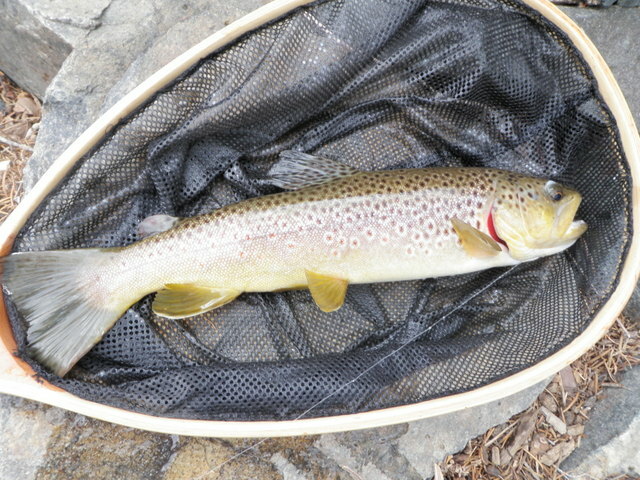 First I floated a light gray caddis over the brown and it wiggled its tail, but showed no additional signs of feeding. Next I tried a light gray comparadun, and this provoked the trout to move upward three times, but in each case it returned to its holding position after getting no closer than six inches. A small size 18 comparadun with a light yellow body was totally ignored. Next I spotted a size 14 comparadun with a medium olive body, probably a version I tied to imitate the cornuta hatch in Pennsylvania. This fly brought out the worst in my targeted foe as it rose and put its nose against the olive imitation three times, but never opened its mouth to eat. With this indignity now on my record, I glanced at my watch and reailized it was approaching 5PM, so I called it quits and gave the win to the ultra selective trout in front of me. Location: Upstream from Lodgepole Campground where fisherman path ends and river widens. 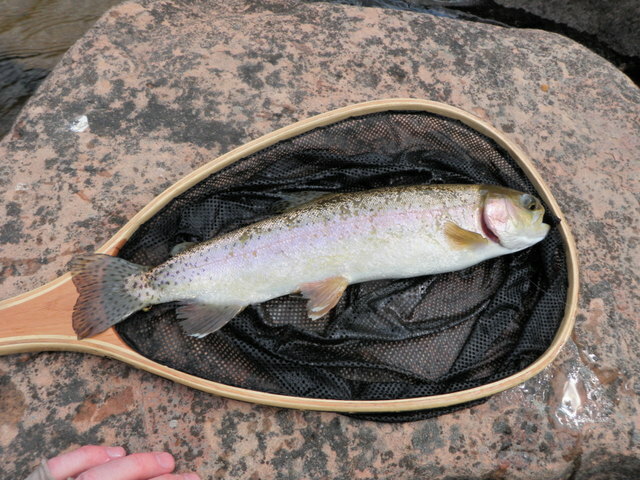 It had been a week since I last fished with Dan on South Boulder Creek, and that outing was cut short by steady rain. My friend, Don Batchelor, drove to Colorado from State College, Pa. so I dedicated Monday through Wednesday to spend time with him. Don is not a fishermen, so we had a blast undertaking hikes to Devil’s Backbone near Loveland, Red Rocks near Morrison, and Walker Ranch near South Boulder Creek. In addition we spent Tuesday afternoon using B-Cycle stations to bike among various locations in downtown Denver. Don arose quite early on Thursday morning and departed before Jane and I awoke. Jane and I made plans to camp along the Taylor River for the upcoming weekend, so I occupied myself with completing a few chores and gathering all the essentials for a weekend of camping. I planned to drive to the Taylor River valley on Thursday and set up camp, and then Jane would make the trip on Friday after work and join me for the weekend. By 10:30PM my fishing gear was stashed as well as all the necessary camping gear and bicycling essentials, and I’d topped off the tank with gasoline and bought a fresh bag of ice for the cooler, and I was on my way. As I made my way up Cottonwood Pass west of Buena Vista I encountered some dark skies and it began to rain fairly heavily. In fact the intensity picked up at the top of the pass and created a fairly slippery road surface as I descended on the western side of the pass. I arrived at Lottis Creek Campground by 2:30 and the rain had subsided to a steady drizzle, but the sky remained dark and threatening. I didn’t relish putting up my tent in the rain, so I unloaded the bikes and bike rack and placed my water container on the picnic table to announce my claim to site number 8 in the Union Park Loop of Lottis Creek Campground. I decided the best activity for the light rain was fishing, so I continued on down the highway to a wide pullout just above the paved parking lot across from Lodgepole Campground. I quickly put on my waders and rigged my rod and began fishing along the right bank with a size 12 parachute green drake as I’d read in the Willowfly Angler fishing report that a few green drakes were observed. Trout seem to have a long memory for large western green drakes. It didn’t take long before I landed a 12 inch brown on the green drake and I photographed my initial fish to document the effectiveness of my new fly. Quite early in my late afternoon fishing experience, the rain ended, but the skies remained overcast with only occasional glimpses of blue sky and a few rays of the sun. I continued upstream with the green drake and after a few refusals, I landed a small rainbow, but after this success the refusals resumed. As I observed and considered switching away from the green drake, I noticed a few fairly large PMD’s in the air, so I tied on a size 14 light gray comparadun. This translated into a fine move as I fished the comparadun for the remainder of the afternoon until 6:30PM when I quit, and it produced 13 additional fish. By 6PM it rained again briefly, but I continued fishing for another half hour and landed two nice rainbows in a shallow riffle close to the road. In fact the last rainbow and last fish of the day was a 14 inch rainbow that rose and confidently sipped the scruffy comparadun. In three hours of fishing after the rainstorm under overcast skies I landed fifteen trout, four rainbows and eleven brown trout. One rainbow was 14 inches and a couple browns were in the twelve inch range. Overall the size of the fish was somewhat lacking, but it was quite enjoyable to fish to a steady hatch of pale morning duns, and quite a few of my landed fish resulted from spotting a sporadic rise and then tossing the comparadun to the spot of the rise. In most instances, the trout that revealed itself would cooperate and sip in my imitation. With this steady action under my belt, I returned to the campsite and put up my tent now that the rain stopped. In fact I began to see blue sky to the west and the weather cleared nicely as I prepared my light dinner. I looked forward to a fun full day on the Taylor River on Friday before Jane was due to arrive in the late afternoon.